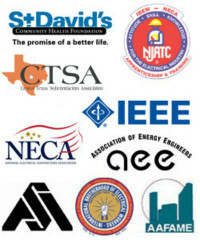 Parker Electric is a full service electrical contractor located in Austin, Texas. We are licensed throughout the state of Texas (Master Electrical Contractor License #14592, State of Texas Electrical Contractors License #17086). Founded in 1982, our reputation for quality workmanship has allowed us to become one of central Texas's premier electrical contractors. We are proud of our history and performance on many different commercial, industrial, high-tech, institutional, medical and large residential projects. Our capabilities and services cover all aspects of electrical work including new construction, renovations, tenant fit-up, engineering/design and service/ maintenance.